The OSD is located in the Student Success Center (SSC), on the lower level of Alumnae Hall. Individuals seeking accommodations may call 570-674-6408 or email Kristen Ricardo, Assistant Director SSC/Office for Students with Disabilities at kricardo@misericordia.edu. All students entering the University may self disclose via the Request for Accommodations Form, which affords them the opportunity to seek academic adjustments, auxiliary aids and services under Section 504 free of charge. Students with a documented disability may seek services at any time. Students may also elect to apply to Misericordia University's Alternative Learners Program (ALP). ALP is designed to provide support to students with disabilities that extend beyond those accommodations required under the University's Section 504 program. ALP students pay a fee each semester for participation in the program. Personnel from the Office for Students with Disabilities complete an intake process in which the student's expressed needs and the disability documentation are reviewed. Eligibility for services is based on a combination of the student's description of need, the thoroughness of the disability documentation, and documentation policies. Students determined eligible for either 504 and/or ALP services receive an Accommodation Plan to initiate service delivery. All students entering the University may self disclose via a Request for Accommodations Form, which affords them the opportunity to seek academic adjustments, auxiliary aids and services under Section 504 free of charge. Students with a documented disability may seek services at any time. A qualified professional must provide documentation and interpretation which clearly identifies and explains the applicant's disability. Aptitude/Cognitive Ability: The preferred instrument is the Wechsler Adult Intelligence Scale (WAIS III). The results of Woodcock Johnson III Tests of Cognitive Abilities, Wechsler Intelligence Scale for Children (WISC-III), or Stanford Binet Intelligence Scale IV are also acceptable. Other: Pertinent diagnoses or recommendations from other evaluations as needed. A specific diagnosis that conforms to the most recent publication of the Diagnostic and Statistical Manual (DSM) of the American Psychiatric Association for Attention Deficit Disorder, with or without hyperactivity. Current functional limitations on major life activities, resulting from the Attention Disorder. Evidence to support the functional limitations derived from Aptitude/Cognitive Ability and Achievement testing as described in the previous paragraph related to applicants with learning disabilities. Requested accommodations; additional information (optional): Tests of information processing, clinical observations/interview, teacher observations. Other pertinent diagnoses or recommendations from other evaluations that may be needed. Documentation must be completed by a professional qualified to diagnose the nature and extent of the disability. Documentation from a professional must be no more than one year old. Documentation must contain a specific diagnosis, state major life activities limited by the disability and resulting functional limitations, and list prescribed medications. Other pertinent evaluations as needed. At the beginning of each semester, a student who is registered with the Office for Students with Disabilities (OSD) should contact the OSD for an updated Accommodation Plan (AP)Examples of accommodations include: extended time on tests, use of a note sharer, and recording of lectures. Once the AP is completed and approved by the student and the OSD, faculty can be informed of the accommodations they can expect to be utilized by the students. Students should provide a copy of the AP to their professors. By contacting the OSD each semester and informing the professors in a timely manner, students who need accommodations will be supported for academic success. Any student who has concerns about the provision of reasonable accommodations should first contact the Office for Students with Disabilities. In 1979, the Alternative Learners Program (ALP) was founded as the first program of its kind in Pennsylvania to provide support to students with learning disabilities. Since that time, the ALP has focused on helping students with all types of disabilities to succeed in college. With a dedicated professional staff that includes highly-qualified full-time program coordinators, two testing center coordinators, and an abundance of cooperation and support from an excellent faculty and administration. Students who are served by the ALP participate in regular university classes - the same courses all MU students take. There are no special courses, special sections, or special teachers. 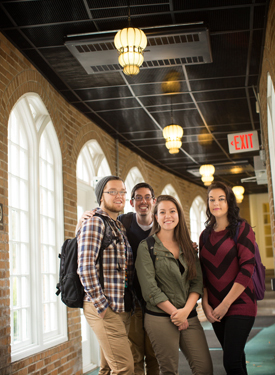 Our majors dictate which courses and experiences students must complete. Participation in the BRIDGE Program, which provides incoming first-year ALP students the opportunity to arrive on campus early (one week prior to the start of the fall semester) and features a series of assessments and workshops designed to assist students in identifying both strengths and needs in their learning styles. Training in the use of the Learning Strategies a course designed to help students with disabilities become more effective and efficient learners through the development of academic skills and study methods. An individualized Program of Accommodations (POA), an array of strategies and supports that students can use to bypass challenges produced by their disabilities. Support by a staff of master-level prepared Program Coordinators. Prior to the beginning of each semester, the ALP staff works with students to establish their POA, which includes a list of courses to be taken, the names of the professors, and a list of accommodations the students should use during the semester. Accommodations, such as Kurzweil Text to Speech software, scanners, note-sharing services, and alternative test-taking procedures allow students to work around their disabilities. The services listed on a student's POA are intended to support each individual's areas of need. However, the accommodations do not minimize the necessity for ALP students to master the essential academic competencies required of all students. Curriculum requirements in students' majors are not otherwise adjusted. With the student's approval, the Program Coordinator (PC) shares the POA (and no other information) with affected members of the faculty and the student's advisor. In doing so, the ALP notifies professors of the students served by the Program (if any are in their classes) and which accommodations will be needed by the students. Students do not have to ask faculty for anything: ALP staff do all of the arranging. Moreover, we do not ask faculty to teach or test differently; we just ask them to allow us to provide the accommodations. As students progress, they become more personally responsible for dealing with faculty members, However, ALP staff and support are available whenever needed throughout the students' years at Misericordia University. In addition to the supports provided by the ALP, Misericordia University offers a wide variety of special services that may be accessed by ALP students. Counseling, peer and on-line tutoring, writing center services, and general and specialized career programs are also available. Each student interested in applying for admission to ALP should submit the following documents to the Assistant Director, Student Success Center/Office for Students with Disabilities. A personally written cover letter which briefly summarizes the student's disability and indicates a desire to participate in ALP. A copy of the most recent IEP or 504 Plan would be helpful. A copy of the student's high school transcript. Two letters of recommendation by educational professionals. A special education teacher (if appropriate) should complete one of these letters. Additional information (optional): Tests of Information Processing, clinical observations/interview, teacher observations. The Assistant Director, Student Success Center/Office for Students with Disabilities will review the aforementioned information along with the standard admission information. If it is determined that an individual is a suitable applicant, he/she will be invited for an on-campus 60 to 90 minute interview. The interview will be an opportunity for gathering and sharing information. Misericordia University's Alternative Learners Program is designed to provide support to students with disabilities that extends beyond those accommodations required under the University's Section 504 program. ALP students pay a fee each semester for the program as follows which is listed in the University fee schedule. Misericordia University is committed to a policy of ensuring that no otherwise qualified individual with a disability is excluded from participation in, denied the benefits of, or subjected to discrimination in university programs or activities due to his or her disability. The university is fully committed to complying with all requirements of the Americans with Disabilities Act of 1990 (ADA) and the Rehabilitation Act of 1973 (section 504) and to providing equal educational opportunities to otherwise qualified students with disabilities. Any university student who believes that he or she has been subjected to discrimination on the basis of disability or has been denied access or accommodations required by law shall have the right to invoke the Office for Students with Disabilities Grievance Procedure. This procedure is designed to address disagreements or denials regarding requested services, accommodations, or modifications to university academic practices or requirements. The Office for Students with Disabilities Grievance Procedure is not intended and shall not supersede other university policies and procedures. A student should first attempt to resolve his or her complaint informally by meeting with the Assistant Director of the Student Success Center/Office for Students with Disabilities when the accommodation-related concerns arise. If the grievance is not resolved informally then the student has the right to invoke the appropriate formal grievance procedure detailed below. If you wish to file a formal grievance, you may do so by submitting a written and signed grievance to the Director of the Student Success Center within 10 working days of the Assistant Director’s decision regarding the Informal Grievance Procedure. The Director of the Student Success Center will assess the formal complaint and review all necessary information. Relevant information may be requested from involved parties. The Director of the Student Success Center will issue a written finding to the student upon completion of the review within 10 working days of the receipt of the formal grievance and supporting documentation. If you disagree with the determination, you may submit a written and signed appeal within 10 working days of the receipt of the Director’s written decision to the Vice President of Academic Affairs. The Vice President of Academic Affairs will make a determination on the appeal within 20 working days and inform the student in writing of the outcome. "No otherwise qualified person with a disability in the United States...shall, solely by reason of disability, be denied the benefits of, be excluded from participation in, or be subjected to discrimination under any program or activity receiving federal financial assistance." Students may also elect to apply to Misericordia University's Alternative Learners Program (ALP). Founded in 1979, ALP was one of the nation's first formal college-level programs for students with learning disabilities. In 1995, the program expanded to serve all students with disabilities who attend the University. ALP is designed to provide support to students with documented disabilities that extends beyond those accommodations required under the University's 504 program. ALP students pay a fee each semester for participation in the program. Architecturally accessible buildings and facilities. Reasonable services such as qualified sign language interpreters. Provision of reasonable accommodations such as extended time on exams or in-class assignments, priority seating assignments, use of assistive devices or technology such as recorders for class notes, note sharers, and other accommodations or services. A reasonable accommodation is any modification or adjustment that will allow a student with a disability to perform in a program or have the same rights and privileges as students without disabilities. Reasonable accommodations make it possible for a student with a disability to participate fully in the educational programs and activities; and for the faculty member to fairly evaluate the student's understanding of the material without interference from the disability. Information regarding a disability is treated as confidential information as defined by the Family and Educational Rights and Privacy Act (FERPA) http://www.ed.gov/offices/OM/ferpa.html. Information about the existence and details of an individual's disability will be shared by the OSD on a "need-to-know" basis only. Students are asked to sign a written release of information which is kept on file; and the student is informed that OSD staff must have permission to share disability status with instructors in order to facilitate the provision of accommodations. Obviously, a student can voluntarily choose to share information regarding his/her disability with faculty or staff. If a student does share this information with you, please remember that the information should remain confidential. Apply and be accepted for admission at Misericordia University. Students with disabilities go through the standard admissions process. Note: Students applying to the Alternative Learners Project must also complete the ALP application process. 504 students complete a Request for Accommodations Form and return it along with sufficient documentation including an evaluation performed by a qualified professional(s). Contact the Office for Students with Disabilities for more information. After a request and sufficient documentation has been received by the Office for Students with Disabilities (OSD), the student is required to meet in person with the Assistant Director of the SSC/OSD to discuss reasonable accommodations. In this meeting, an Accommodation Plan (AP) stating the reasonable accommodations that should be provided is given to qualified students with disabilities. ALP students will develop a Program of Accommodation (POA) with their Program Coordinator. Qualified 504 students with disabilities at Misericordia University will provide their instructors with the AP from the OSD in a timely manner. If the student is unable to deliver the Accommodation Plan(AP), a member of the OSD will deliver the AP on the students behalf. It is strongly recommended that this be done in the first week of class. ALP coordinators will provide POAs to faculty members on behalf of their students. Faculty/Staff have the responsibility to comply with the provision of authorized reasonable accommodations in a reasonable and timely manner. Faculty/Staff members should meet individually with the student to discuss the details. If a student requests accommodations for a disability, but does not provide the supporting documentation in the form of an AP or POA, please refer the student to the OSD. If an accommodation request is something that you would feel comfortable providing for any student (for example, closing the door to reduce distractions or providing seating near a window for natural light) the accommodation may be provided without consulting with OSD. However, it is advisable to refer any accommodation request that is questionable to OSD. Please consult with the OSD staff if you have any concerns regarding the appropriateness of or the proper way to facilitate a particular accommodation. Although the Americans with Disabilities Act and Section 504 of the Rehabilitation Act help define how to best accommodate and provide equal access to students with disabilities, certain myths concerning services to students with disabilities continue to exist. Academic accommodations for persons with disabilities should not imply lower academic standards. Most accommodations in the classroom are inexpensive, require minimal time, and do not have an impact on academic standards. Moreover, we must remember that providing accommodations to individuals with disabilities is not unfair to other students. Rather, it is the means by which the individuals with disabilities are provided equal access to all the programs, services and activities provided by the University. Additionally, persons with the same disability may have different needs and levels of difficulty with similar course materials. Each student with a disability should be approached as an individual, and should have input regarding how mutually satisfactory solutions and accommodations can be developed. When discussing a student's disability and accommodation needs, talk only about needs that are relevant to the successful completion of coursework. Often, the most difficult aspect of living with a disability is the negative attitudes of others. It is important for faculty and staff to be aware of this situation when working with a student with a disability. Some students may feel uncomfortable discussing or even disclosing their disability. Remember that an individual with a disability is like anyone else, except for specific limitations of the disability. Be yourself when you meet an individual with a disability, and talk about the same things you would with anyone else. Don't make assumptions about the skills or deficiencies of an individual with a disability. Talk directly to an individual with a disability, not to someone accompanying him/her. Don't be overprotective or over-solicitous, and don't offer pity or charity. Don't assume that an individual with a disability has other limitations; e.g., don't raise your voice when speaking to a person who is visually impaired. An individual's disability should not be disclosed to someone who does not have "a need to know." Information regarding a disability is confidential. Do not ask a question you would not want to answer yourself.